Cancer is a lethal threat which seems to afflict ever greater numbers of people. Everyone here has either suffered himself or herself, or knows someone who has, from this devastating disease. "Cancer is a genetic disease resulting from a variety of mutations and alterations either inherited from our parents or, more commonly, acquired over time due to environmental exposures and behaviors, such as smoking and poor diet. These alterations turn off important cell growth regulators allowing cells to continually divide unchecked, explains Luis Diaz, a clinician-scientist in Ludwig Center for Cancer Genetics. This type of cell is called a malignant or cancer cell. Among the trillions of cells in the human body, inevitably everyone has some abnormal or atypical cells that possess some of the characteristics of cancer cells, most resolve themselves and never result in cancer, says Diaz. In every body except one there are pathologies. In each human nature except that of Jesus Christ we find the potential for illness and the certainty of death. Jesus Christ is perfect God and perfect Man. He is Life and He gives Life. "There was a woman afflicted with hemorrhages for twelve years. She felt in her body that she was healed of her affliction." "There is no health in my limbs, my guilt towers higher than my head: it is a weight too heavy to bear." The truth of God spoken by Christ the Lord teaches us that far worse than any bodily suffering which is limited to this life and to this world is the malady of sin which "can cast both body and soul into Gehenna": the separation from God that lasts forever. We touch Christ sacramentally so that His mercy might heal us of this everlasting pain. The blood and water that flowed from His side as He hung on the Cross continues to flow in and through the Church as His gift in the Holy Spirit. "though he was rich, for your sake he became poor, so that by his poverty you might become rich." Does not Saint Paul describe in his letter to the Hebrews the total self-gift of God in Jesus Christ, whose side is pierced once again on the Cross, in an unbloody manner, each time the Holy Sacrifice of the Mass is offered? Does not God, rich in Divinity, become poor for our sake, making us rich by the outpouring of His love and grace for sinners through forgiveness? Today we do more than merely touch the hem of His garment: we eat and drink no less than His very Body, Blood Soul and Divinity. In the sacramental life which He left the Church, as the Apostles handed down, we live the very life of the healing Christ here and now. 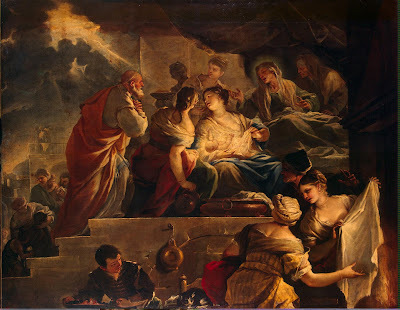 In this moving Gospel passage about the woman suffering from a hemorrhage the Church has always seen its own story of sacramental life in which "power goes out" continually from Christ the Lord to heal and save the members of His mystical Body on earth. 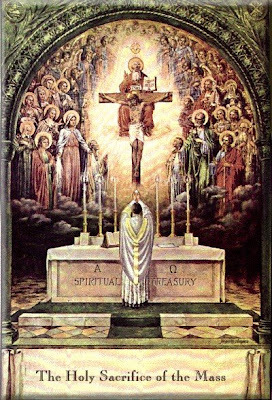 The waters of Baptism and the Blood of Christ, indeed all the sacramental life of the Church came forth, once for all, from the side of the Lord on the Cross. 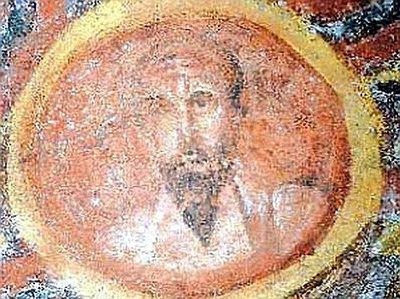 Image: Fresco, Catacomb of Sts. 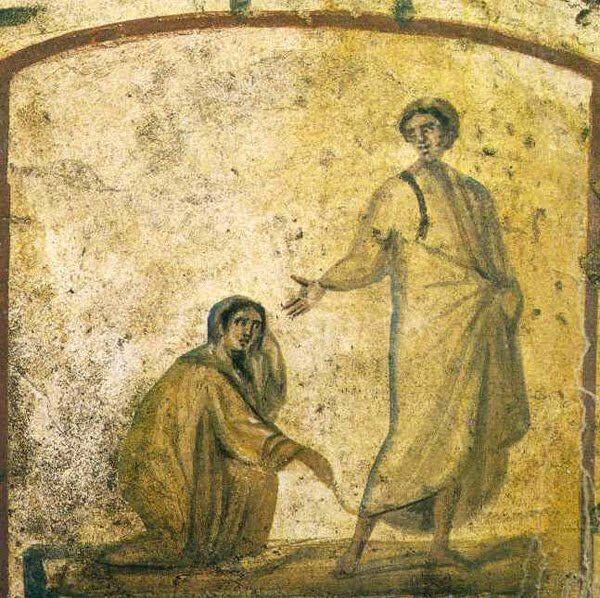 Marcellinus and Peter, Rome, early 4th Century showing the haemorrhissa being healed by touching Christ’s garment (Mk 5:25–34). First Holy Martyrs of the Church of Rome: "they will kill you"
But the one who perseveres to the end will be saved. It is not easy for man, wounded by sin, to maintain moral balance. Christ's gift of salvation offers us the grace necessary to persevere in the pursuit of the virtues. Everyone should always ask for this grace of light and strength, frequent the sacraments, cooperate with the Holy Spirit, and follow his calls to love what is good and shun evil. Solemnity of Saints Peter and Paul, Apostles: "I, Paul, am ... being poured out"
... and the time of my departure is at hand. I have competed well; I have finished the race; I have kept the faith. From now on the crown of righteousness awaits me, which the Lord, the just judge, will award to me on that day, and not only to me, but to all who have longed for his appearance. He who climbs never stops going from beginning to beginning, through beginnings that have no end. He never stops desiring what he already knows. 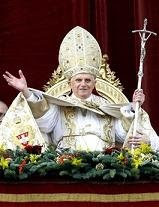 Wednesday, Week 12: "Beware of false prophets"
who come to you in sheep's clothing,but underneath are ravenous wolves. Faith is first of all a personal adherence of man to God. At the same time, and inseparably, it is a free assent to the whole truth that God has revealed. As personal adherence to God and assent to his truth, Christian faith differs from our faith in any human person. It is right and just to entrust oneself wholly to God and to believe absolutely what he says. It would be futile and false to place such faith in a creature. Tuesday, Week 12: "Enter through the narrow gate"
How narrow the gate and constricted the road that leads to life. And those who find it are few. The affirmations of Sacred Scripture and the teachings of the Church on the subject of hell are a call to the responsibility incumbent upon man to make use of his freedom in view of his eternal destiny. They are at the same time an urgent call to conversion: "Enter by the narrow gate; for the gate is wide and the way is easy, that leads to destruction, and those who enter by it are many. For the gate is narrow and the way is hard, that leads to life, and those who find it are few." Since we know neither the day nor the hour, we should follow the advice of the Lord and watch constantly so that, when the single course of our earthly life is completed, we may merit to enter with him into the marriage feast and be numbered among the blessed, and not, like the wicked and slothful servants, be ordered to depart into the eternal fire, into the outer darkness where "men will weep and gnash their teeth." Monday, Week 12: "Give up your evil ways"
Stop judging, that you may not be judged. Man is divided in himself. As a result, the whole life of men, both individual and social, shows itself to be a struggle, and a dramatic one, between good and evil, between light and darkness. St John the Baptist was guilty of getting entangled in the politics of his day. Herod through his immoral adulterous lifestyle flouted God's laws about marriage and scandalized others into disobedience. The last and the greatest of the prophets, Saint John, challenged him on it. As a result of his courage to speak out, Saint John lost his head. Our Catholic Faith is given in Christ by God for the purpose of gaining heaven as Saint John the Baptist did. 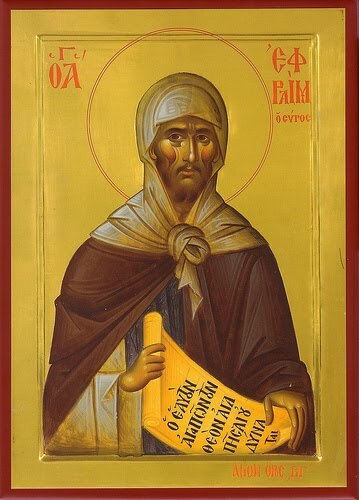 On our way to that place of eternal happiness, laughter and love with God and all the saints we need to be able to act at all times in accord with our Faith and to speak out, preaching the Faith in our words and actions as did Saint John the Baptist. If we act ashamed of God before the world in this life by refusing to publicly witness to the truth as did Saint John the Baptist, Jesus Christ has promised us that He will be ashamed of us before His heavenly Father. It is providential that this feast of the last and the greatest of prophets falls within the Fortnight for Freedom led by our Catholic bishops in order to draw attention to the necessity of religious freedom, the first of our rights. Without the freedom given by God and respected by the state, we cannot live out our Baptismal vocation as called to by Almighty God. Faithful citizenship, as taught by our bishops, demands full and active engagement with the society and culture around us in order to bring the light, love and salvation of Christ to the whole world. John live in faithful and prophetic witness to Christ, made necessary by love, until the end. Unlike Saint John, who received the fullness of the Holy Spirit while he was still in the womb of his mother Elizabeth, we were born into the Holy Spirit after our birth through the sacrament of Baptism. Like John, though, we have been given the Spirit of God who is love in order to witness in love to others. Witness means showing consistency between what we believe and how we live. Witness also sometimes means "martyr", as for Saint John, giving our lives for God in order to remain faithful to the end. Wednesday, Week 11: "Take care not to perform righteous deeds"
... in order that people may see them. Hope, O my soul, hope. You know neither the day nor the hour. Watch carefully, for everything passes quickly, even though your impatience makes doubtful what is certain, and turns a very short time into a long one. Dream that the more you struggle, the more you prove the love that you bear your God, and the more you will rejoice one day with your Beloved, in a happiness and rapture that can never end. Tuesday, Week 11: "love your enemies"
The murder of a human being is gravely contrary to the dignity of the person and the holiness of the Creator. Monday, Week 11: "When someone strikes you"
on your right cheek, turn the other one to him as well. In the Sermon on the Mount, the Lord recalls the commandment, "You shall not kill," and adds to it the proscription of anger, hatred, and vengeance. Going further, Christ asks his disciples to turn the other cheek, to love their enemies. He did not defend himself and told Peter to leave his sword in its sheath. The legitimate defense of persons and societies is not an exception to the prohibition against the murder of the innocent that constitutes intentional killing. "The act of self-defense can have a double effect: the preservation of one's own life; and the killing of the aggressor. . . . The one is intended, the other is not." The Church of Washington has five new "fathers". It was appropriate on this father's day weekend that I would begin it by celebrating an event of central importance with the local Church at which five new priests were added to the presbyterate of the Archdiocese of Washington. I participated with joy in the Mass with the cardinal, bishops, brother priests, deacons, women and men of religious communities and so many families and lay members of the Church who filled the beautiful basilica and became all together so many voices joined together in the oneness of prayer and praise that manifests the Body of Christ, the Kingdom in our midst, in the fullest way. This is part of the growth of the kingdom the Lord describes in today's Gospel: "the seed would sprout and grow, he knows not how." You may have noticed a change in the landscape around the rectory. I have planted a garden each year, delighted at the process by which the seeds I plant sprout and grow. I do not need to know how this mystery takes place in order to cooperate in the process. I am content to be delighted at the results even though the way in which it happens remains very much a mystery hidden in the designs of the Creator. These men began their vocations like a small seed, which had to be nourished with care so that it might grow big and strong, like that tree in today's Gospel that even becomes sufficient for creatures to live in it. That is why the place in which men are formed to be priests is called a "seminary", describing this process which is partly a mystery to us in which a man grows to become a close collaborator with the Lord in the mystery of our redemption, itself growing like the small seed of a new vocation to become the largest of plants. As a matter of fact, when we attain our heavenly glory the Kingdom in which we live will be the largest reality imaginable because it will be as big as God Himself: infinite in love, glory and grace and joy. "... to his own disciples he explained everything in private." 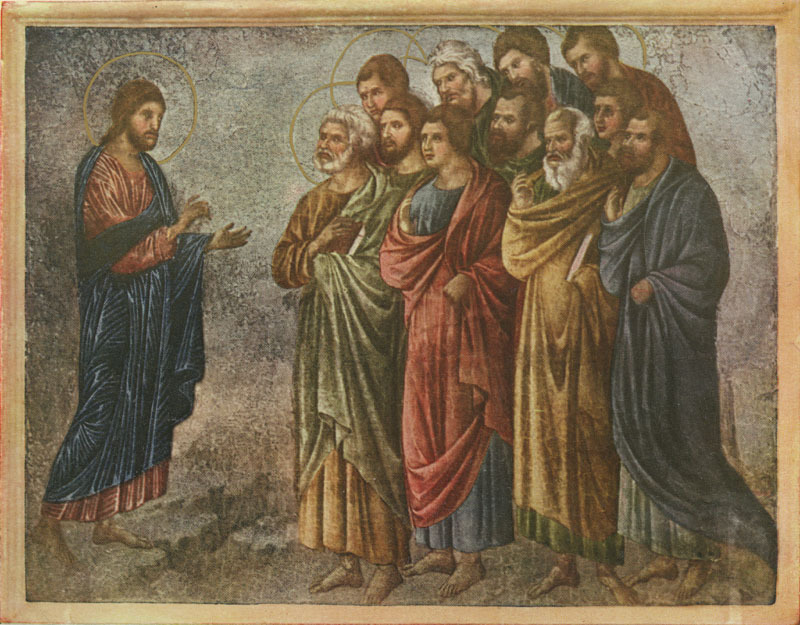 In the life of the first seminary the Lord Himself did the work of the formation of the Apostles, elaborating in more detail for his closest disciples upon the parables by which He began to explain the mysteries of Faith to the people. Our work for the mission continues in collaboration with our bishops who also today undertake the formation of priests, they and their co-workers "explaining everything in private" within the setting and life of the seminary. The work of the Kingdom which the Lord began continues also for all of us. The bishops are the authentic teachers of the Faith. Archbishop Lori recently spoke out about the effort to defend religious freedom. "In a presentation on religious liberty issues, Archbishop William E. Lori of Baltimore ,chairman of the bishops' Ad Hoc Committee on Religious Freedom, acknowledged the U.S. bishops' 'fortnight for freedom' campaign has come under heavy criticism in the secular media, in the blogosphere and by some Catholics as being a partisan political effort.
" 'But the two-week period is meant to be free of politics and will emphasize church teaching on religious freedom', he said. "The upcoming fortnight, which takes place June 21-July 4, will be a period of prayer, education and action aimed at explaining how a federal health care contraceptive mandate violates religious principles. The mandate requires most religious employers to provide free health insurance coverage for contraceptives, abortion-inducing drugs and sterilizations. "At the end of the discussion on religious freedom in the United States, the bishops affirmed by a unanimous voice vote a recent statement of the USCCB Administrative Committee regarding the HHS mandate titled 'United for Religious Freedom.' "
On this Father's Day weekend we rightly celebrate the fatherhood of our men who answer the call to the vocation of holy matrimony as those who make up the largest group as natural fathers in the Church. They answer a heroic call with their spouses to cooperate with God to bring new life into the world. We also look to our bishops as "fathers" in the life of the Faith, who teach us what it means to love and believe in Christ the Lord as we together with them nurture the seed of Faith for the benefit of all in the growth of the Kingdom. A happy and blessed Father's Day to all of our natural, and supernatural, Fathers. 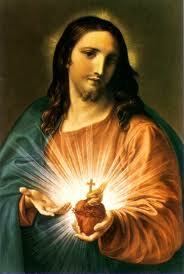 Solemnity of the Most Sacred Heart of Jesus: "the LORD loved you"
Jesus knew and loved us each and all during his life, his agony and his Passion, and gave himself up for each one of us: "The Son of God. . . loved me and gave himself for me." He has loved us all with a human heart. For this reason, the Sacred Heart of Jesus, pierced by our sins and for our salvation, "is quite rightly considered the chief sign and symbol of that. . . love with which the divine Redeemer continually loves the eternal Father and all human beings" without exception. The heart is the dwelling-place where I am, where I live; according to the Semitic or Biblical expression, the heart is the place "to which I withdraw." The heart is our hidden center, beyond the grasp of our reason and of others; only the Spirit of God can fathom the human heart and know it fully. The heart is the place of decision, deeper than our psychic drives. It is the place of truth, where we choose life or death. It is the place of encounter, because as image of God we live in relation: it is the place of covenant. Thursday, Week 10: "whoever is angry"
S Antonio di Padova: "as ministers of God"
The Magisterium of the Pastors of the Church in moral matters is ordinarily exercised in catechesis and preaching, with the help of the works of theologians and spiritual authors. Thus from generation to generation, under the aegis and vigilance of the pastors, the "deposit" of Christian moral teaching has been handed on, a deposit composed of a characteristic body of rules, commandments, and virtues proceeding from faith in Christ and animated by charity. Alongside the Creed and the Our Father, the basis for this catechesis has traditionally been the Decalogue which sets out the principles of moral life valid for all men. 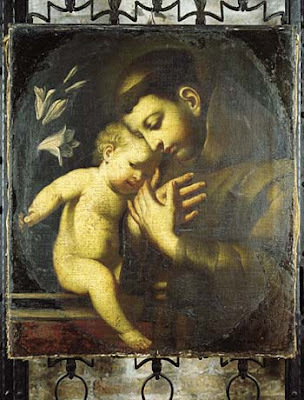 Image of St Anthony at the Basilica del Santo in Padova, Italia. Click here to visit the official site for the Basilica. Tuesday, Week 10: "You are the salt of the earth." your light must shine before others, that they may see your good deeds and glorify your heavenly Father. - It is the People of God: God is not the property of any one people. But he acquired a people for himself from those who previously were not a people: "a chosen race, a royal priesthood, a holy nation." - One becomes a member of this people not by a physical birth, but by being "born anew," a birth "of water and the Spirit," that is, by faith in Christ, and Baptism. - This People has for its Head Jesus the Christ (the anointed, the Messiah). Because the same anointing, the Holy Spirit, flows from the head into the body, this is "the messianic people." - "The status of this people is that of the dignity and freedom of the sons of God, in whose hearts the Holy Spirit dwells as in a temple." - "Its law is the new commandment to love as Christ loved us." This is the "new" law of the Holy Spirit. - Its mission is to be salt of the earth and light of the world. This people is "a most sure seed of unity, hope, and salvation for the whole human race." -Its destiny, finally, "is the Kingdom of God which has been begun by God himself on earth and which must be further extended until it has been brought to perfection by him at the end of time." "O Sacrament Most Holy, O Sacrament Divine, all praise and all thanksgiving be every moment thine!" What is the one thing most necessary in life? What is the one thing for which you spend the most time, money and effort? Authentic Christianity brings unity and integrity to living. Profession of faith in Christ requires integrity between one's words and actions. Idolatry brings conflict into the life of man, such that he is divided between God, the one thing necessary, and false gods which are all those things which replace God in his day to day life. In order to survive with faith intact and to live the truths of faith, Christian men and women today must fight against the idolatries of career, money, materialism; in short, "having it all." Of all the things we "have" do we place first that which alone will last? Persons beyond counting have chased after fame, only to have it elude their grasp. Others have given all in search of wealth only to find they were dissatisfied without the "pearl of great price". Some have burned themselves out pursuing pleasure divorced from authentic love and then fallen into the despair brought by emptiness and loneliness. Some have triumphed over the world by giving body and soul for the one thing necessary: the Lord Jesus Christ. The martyrs are signs to the world of the madness of laying down one's life, the supreme offering of love, in order to take it up again in heavenly glory. There are more martyrs for the faith in our own century than any preceding it. Most recent among these are 17 Catholic schoolchildren with their teaching sister in Zaire who, as witnesses to Christ's love, refused to reveal their tribal identities to murderous agents of genocide and as a result offered their lives for Christ. All martyrdom comes from a heroic faith whereby man professes Christ as the one thing necessary. By the virtues of hope and charity the Christian imitates the Lord, even unto laying down his life if called by God. 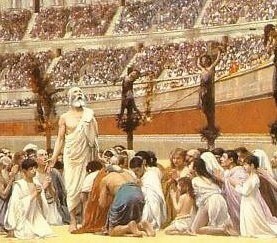 The martyrs of today take a glorious place among the great host of witnesses beginning with St. Stephen and the Roman Martyrs. How did these men and women find the power and the strength to choose God's will as Christ did and to lay down their lives? A little child leads us. The young boy St.Tarcisius was bearing the Eucharist to the sick in ancient Rome and chose to die rather than surrender the Body of the Lord to his ancient pagan persecutors. He is one of the many patrons of the Eucharist who witness to us of its inexhaustible treasures of grace which serve to strengthen us when called to witness to God's sovereignty. It is in the death of the Lord himself that all the martyrs have found their greatest source of strength. The Eucharist is the great memorial of the Lord's passion and death. Much more, the risen Easter Christ is present Body, Blood, Soul and Divinity therein. The Blessed Sacrament is the most effective source of God's grace by which we live as witnesses for generosity among the selfish, for reverence among the irreverent, for faith among the doubting, for hope among the despairing and for heroic love among the murderous and hateful. Today after Mass we will adore our Lord, in union with the universal Church, with the customary procession and benediction for the Solemnity of the Body and Blood of Christ, or, in Latin, "Corpus Christi". By this public act of praise and adoration we call the whole world to fall down in homage before the Savior, most humbly and sacrificially present in the sacred host. What is the one thing most necessary? Jesus Christ truly present in the Eucharist. Will you spend one hour with him this week? S. Ephrem, Deacon and Doctor. "If the Lord is God, follow Him"
Idolatry not only refers to false pagan worship. It remains a constant temptation to faith. Idolatry consists in divinizing what is not God. Man commits idolatry whenever he honors and reveres a creature in place of God, whether this be gods or demons (for example, satanism), power, pleasure, race, ancestors, the state, money, etc. Jesus says, "You cannot serve God and mammon." Many martyrs died for not adoring "the Beast" refusing even to simulate such worship. Idolatry rejects the unique Lordship of God; it is therefore incompatible with communion with God. Friday, Wk 9: "all who want to live religiously"
in Christ Jesus will be persecuted. "The Church . . . will receive its perfection only in the glory of heaven," at the time of Christ's glorious return. Until that day, "the Church progresses on her pilgrimage amidst this world's persecutions and God's consolations." 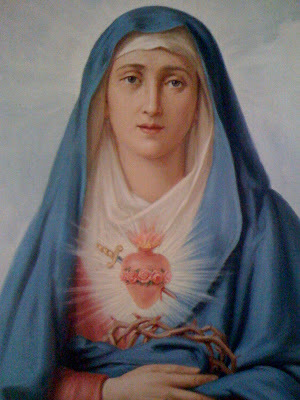 Here below she knows that she is in exile far from the Lord, and longs for the full coming of the Kingdom, when she will "be united in glory with her king." The Church, and through her the world, will not be perfected in glory without great trials. Only then will "all the just from the time of Adam, 'from Abel, the just one, to the last of the elect,' . . . be gathered together in the universal Church in the Father's presence." Thursday, Week 9: "If we have died with him"
S Norbert: "I am not alone"
... because the Father is with me. What is contemplative prayer? St. Teresa answers: "Contemplative prayer [oracion mental] in my opinion is nothing else than a close sharing between friends; it means taking time frequently to be alone with him who we know loves us." Contemplative prayer seeks him "whom my soul loves." It is Jesus, and in him, the Father. We seek him, because to desire him is always the beginning of love, and we seek him in that pure faith which causes us to be born of him and to live in him. In this inner prayer we can still meditate, but our attention is fixed on the Lord himself. Solemnity of the Most Holy Trinity: "The Spirit proceeds from the Father and the Son"
The Resurrection of the Lord, the only Son of God the Father, and the coming of the Holy Spirit reveal the Trinity we celebrate today: three persons in one God. Christ taught the Apostles that the Spirit "proceeds from the Father and the Son" and so we profess this in the Creed. The Resurrection of the Lord Jesus remains the cornerstone of Christian faith and life for by his Resurrection Christ's divinity is revealed and all his words and teachings are thereby guaranteed as true. The whole edifice of Christian faith, all that we believe about God fully revealed in Jesus Christ, stands or falls on the cornerstone of Christ's Resurrection. It is fashionable in the literary and academic world today to "doubt" the Resurrection of the Lord, to revise and rephrase tradition, to reinterpet scripture in order to call the real bodily Resurrection into question. Knowing that men would call the truth into doubt, St. Paul wrote: "If Christ has not risen, your faith is in vain." 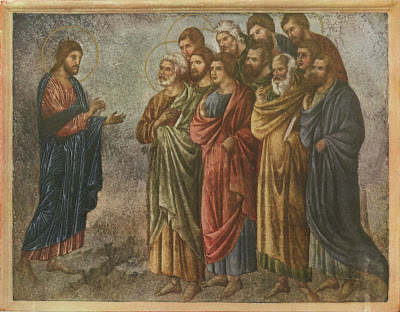 Some Christians propose the Resurrection was experienced only in the faith or credulity of the Apostles or first Christians, something they simply made up out of thin air. It is possible today to hear even Christian leaders say; "If they found the bones of Jesus, it would not shake my faith." It is the lesson of the Ascension of the Lord in scripture and the celebration of the liturgy of the Church that this is completely out of the question! We are left with the testimony of Scripture, and there we find record in several places that the Apostles doubted Christ's Resurrection. "Now the eleven disciples went to Galilee, to the mountain to which Jesus had directed them. And when they saw him they worshipped him; but some doubted." (Mt 28; 16-17) Are we to believe that the Evangelists recorded the doubt of some of their number even while creating a fiction of their own imagination? The liar is the first to recognize the stupidity of giving evidence contradicitng his own falsehood! We too experience doubts as part of our weak human condition. But we also directly experience the Lord Jesus in the proclamation of the Word and in his Body and Blood in the Eucharist. Christ Himself, then, by these his works which give the grace of faith strengthens us to do the humanly impossible and declare with supernatural joy: "Glory to the Father and to the Son and to the Holy Spirit, as it was in the beginning, is now and ever shall be, world without end. Amen. Alleluia." Mindful of Christ's words to his apostles: "He who hears you, hears me", the faithful receive with docility the teachings and directives that their pastors give them in different forms.